The 2014 PLB Belikin Cup kicked off over the weekend, but was only able to stage 3 of the 4 scheduled matches due to inclement weather. We caught up with the monster showdown between the Belize Defense Force and FC Belize inside the People’s Stadium yesterday and it turned out to be a monster show. 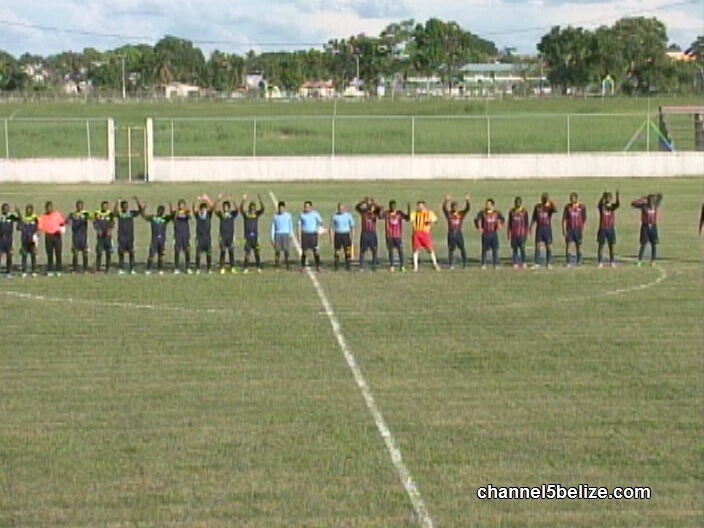 It’s FC Belize looking to open the scoreboard off this set piece launched by Augustino Mendez that forces the B.D.F. to scramble on defense. FC Belize continues to push forward and Oliver Hendricks should have done better with this open look at goal. The B.D.F. responds with this acrobatic launch from Harrison Rasher, but it failed to hit the target. 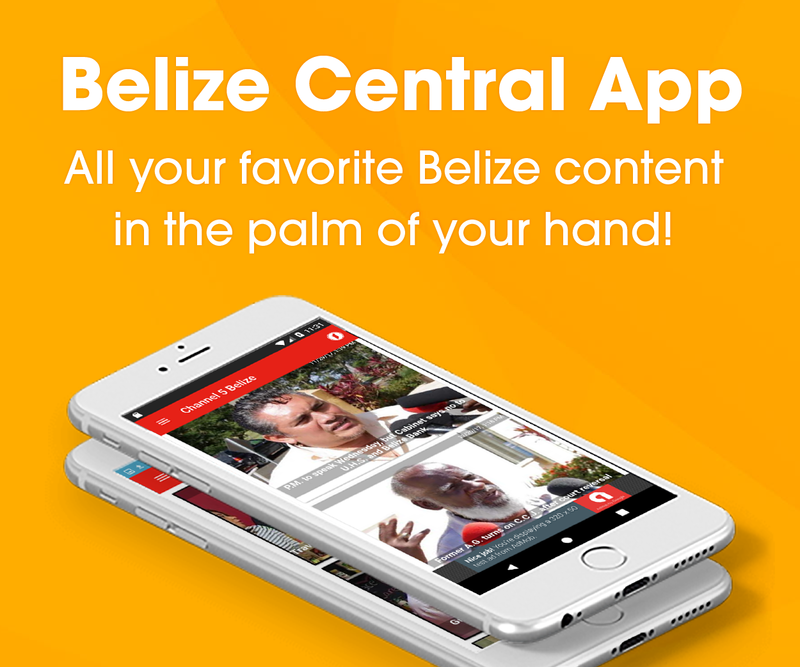 Again, FC Belize attacks off the corner kick and again it’s a good one from Augustino Mendez and again FC can’t come up with the breakthrough. Now folks, you make the call…the B.D.F.’s Jessie Smith has possession, here comes Floyd Jones with the challenge inside the box. Jones protest the referee’s penalty call much too vehemently and escapes with a yellow card. Vallan Symms beats goalkeeper, German Grajales to the near corner as the B.D.F. takes a 1-zip lead at the 30th minute. The B.D.F. looks for more when Shane Flores attacks off the left side, but Grajales comes up with a necessary touch. Andrew Allen then fires this left foot at goal, the tip by Grajales could have given Osmar Duran his goal, but he does not come up with the connection. Just before intermission, Andrew Allen deals to Shane Flores whose right foot punch beats Grajales for the 2-zip B.D.F. lead at the half. 5 minutes after, the action resumes. Oliver Hendricks provides nicely for Christopher Hendricks who manages to hit the near upright. At the 65th minute, Ricky Richlets comes up with this illegal challenge inside the box and the referee rules penalty. Oliver Hendricks gets the call and Fermin Gamboa is beaten as FC pulls on e back for the 2-1 score. The B.D.F. would hold on to the 2-1 big win. 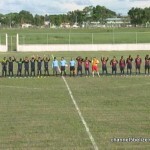 In other action around the league, Verdes FC doubled San Ignacio 4 to 2, Wagiya picked up a road win by blanking Paradise Freedom Fighters 2-zip while Saturday’s match between Belmopan Bandits and Police United was rained out. this match is now rescheduled for Wednesday, October 22nd inside the Isidoro Beaton Stadium. 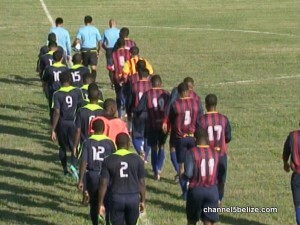 Looking ahead to Week II, Saturday, 7:30 p.m., Placencia Assassin plays host to Police United at the Michael Ashcroft; 3:30 on Saturday, FC Belize faces Verdes at Louisiana Field. 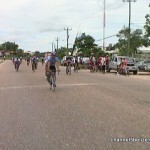 On Sunday, Wagiya will get a visit from Belmopan Bandits and Paradise Freedom Fighters will host the B.D.F. Both matches kick off at 3:30 p.m. 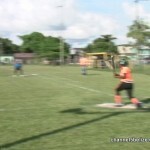 Turning to the softball scene, we caught up with the clash between Caribbean Queen of Carmelita and Orange Walk Jada’s inside the People’s Stadium on Satuday. We’re in the top of the 2nd when Kira Palacio comes up with runners at 2nd and 3rd. She pops up on the infield, but the attempt to out the runner at 2nd base allows the 1st run as Jada’s take a 1-zip lead. In the 3rd, OWJada’s come up big. Anna Gillette makes it a triple with this swing against #47…don’t blame us. The Jada’s pitcher’s name was not on the list. Linda Conorquie brings her home and reaches 1st base on the decision to try for the out at home plate. Folks Conorquie then comes up with this in the park homerun for 2 more runs as Caribbean Queens take a 3-1 lead in the bottom of the 3rd. in the top of the 4th, Kira Palacio smashes this double to centerfield bringing home Claudette Lawrence and Kimberly Williams to tie the score at 4 apiece. In the bottom of the 5th, Yvette Flowers comes up with 2 on and benefits on the error at shortstop to bring the runner home from 2nd. Janice Conorquie comes up in the 6th with this hit that brings Linda Conorquie home. Janel Conorquie unleashes this monster hit to bring home Janice Conorquie and Elizabeth Ico. Unfortunately, Janel would hurt herself on the way to third and would not continue. 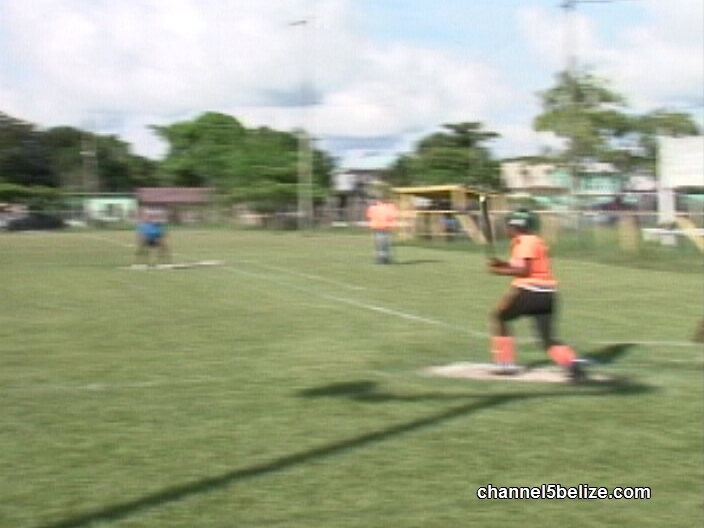 Nevertheless, Carmelita Caribbean Queen goes on to post the 9-6 win over Orange Walk Jada’s to take game 1 in this best of 3 Championship Series. In the CSSSA Volleyball, Friday’s results saw Wesley College beat Sadie Vernon in 2 straight 25-5, 25-10; Belize High School defeated ACC 25-11, 25-3…that’s in female play. 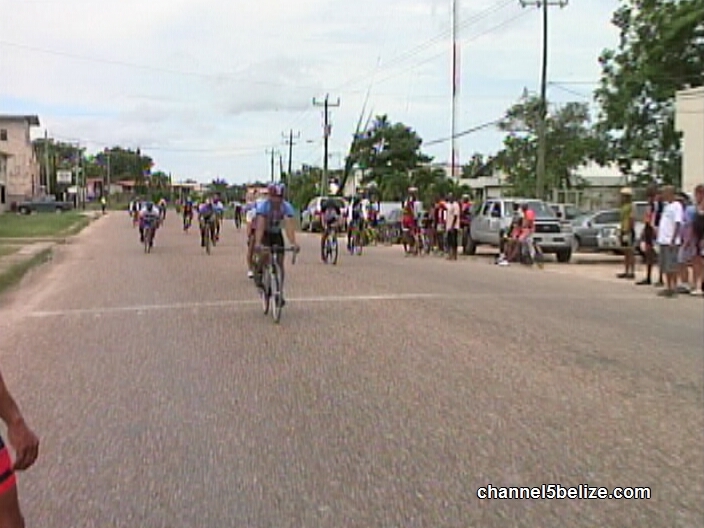 On the male side, Belize High School got the win over Wesley College 25-18, 25-20. Finally in cycling news, here is Wilbert Jones winning the Weekend Warriors 40 mile A-Class race staged yesterday…pulling out of the crowd to win in 1 hours 58 minutes 24 seconds. Barney Brown of Scotia Bank outsprints the pack to take 2nd place with Jack Sutherland. Warren Coye and James Frampton rounding out the top 5 in that order. Jim Scott of Santino’s won the B-Class ride and we say good show Jim. Ryan Willoughby of Stationery House/Medina’s edged out Santino Castillo for 2nd place; Salvador Alvarado took 4th and Coye 5th. Ingmar Perera took the C-Classwith Sheffield Eck 2nd—both of Stationery House/Medina’s—and Lawrence Craig of Truckers took 3rd place.